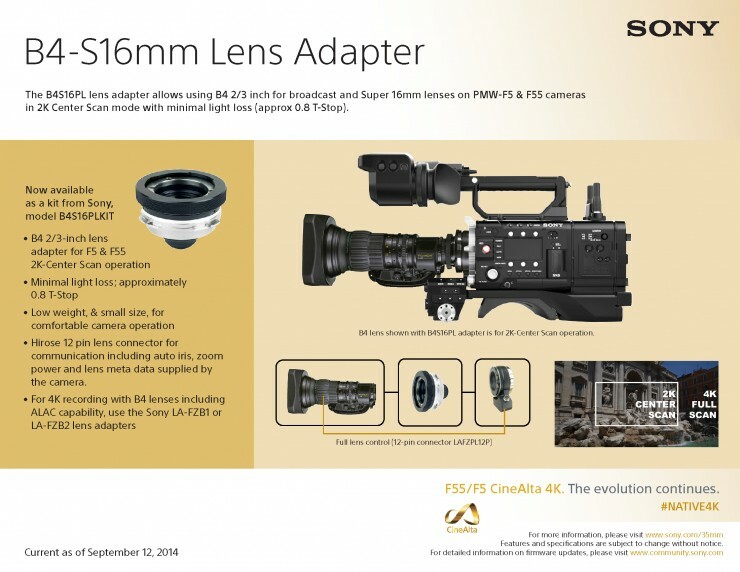 Aside from the brand new FS7 E-mount camera, Sony had a bunch of other news, including prices and availability for their ProRes/DNxHD Upgrade, Shoulder Mount ENG Dock, and likely as a response to the recent 4K hack, a new upgrade option for Sony F5 owners to get 4K XAVC internally. 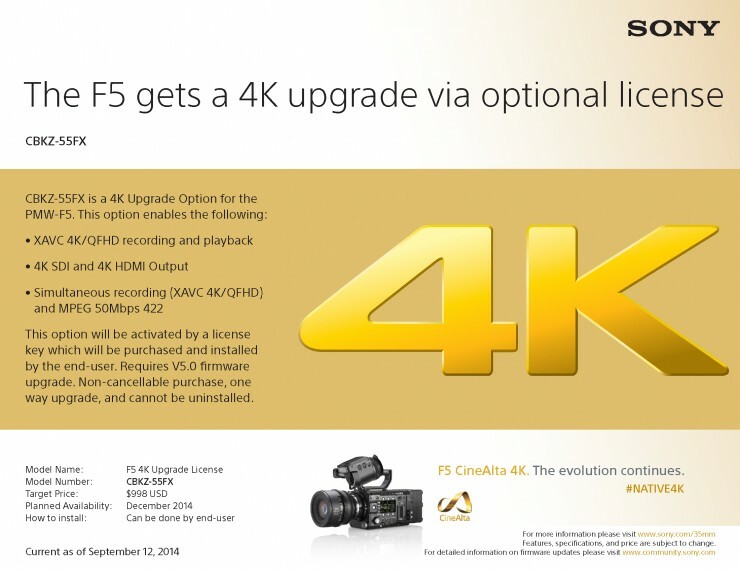 Due to the widespread adoption of 4K in the marketplace, and to further protect customers’ investments in the F5, Sony is implementing 4K internal recording and 4K output capabilities by way of an optional upgrade program. with a simple hack, but Sony will be charging $1,000 for it by the time December rolls around. If you’re trying to shoot 4K for any serious projects, you’re probably going to want the Sony option, because it will be fully supported, and should theoretically work as intended without any issues — something that’s usually a requirement when your job and reputation are on the line. 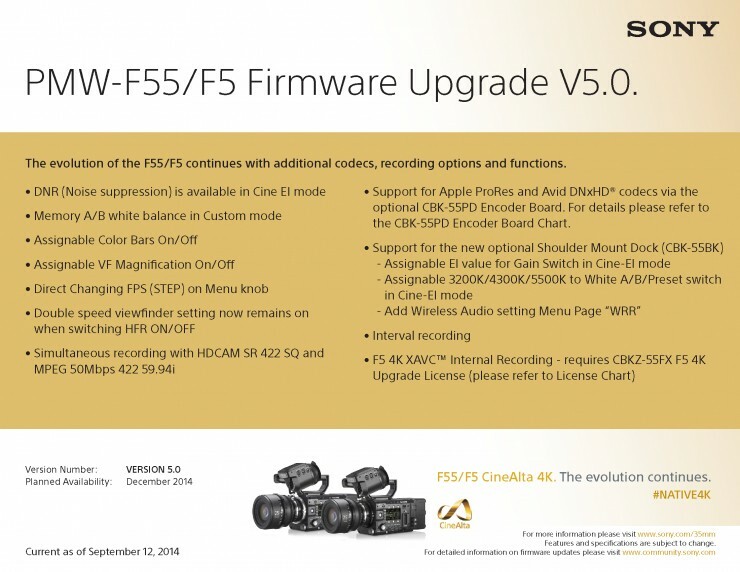 It’s safe to say that firmware v5.0 will probably disable the 4K hack, so if you’re trying to keep your camera up-to-date with the newest features, and you really want internal 4K, you may have to upgrade eventually. 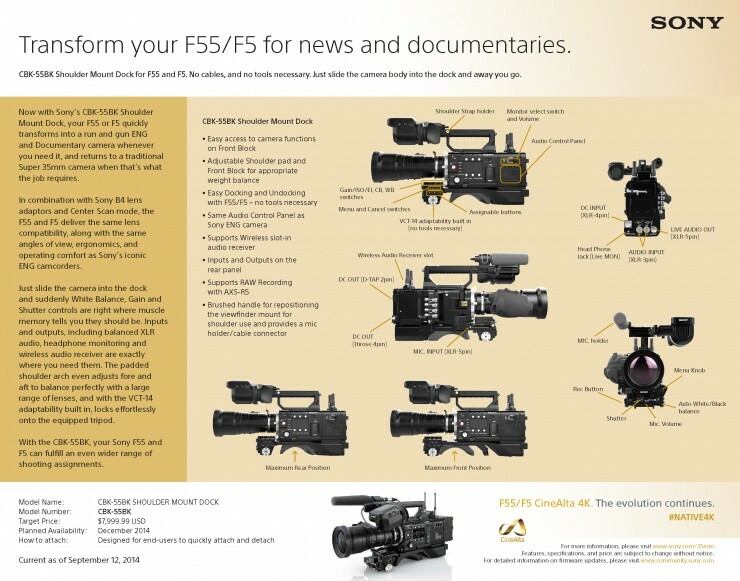 The upgrade now brings the F5 in line with the F55 in most ways, which means the price difference between the models would be just for the global shutter sensor in the F55. Sony’s applications, RAW Viewer and Content Browser are being merged into a single platform. Debuting as two applications are Catalyst Browse and Catalyst Prepare. The development of Catalyst Browse follows industry momentum around the XAVC codec to place it alongside RAW as a major recording format. The new software platform combines the capabilities of conventional RAW Viewer and Content Browser, in addition to new features. 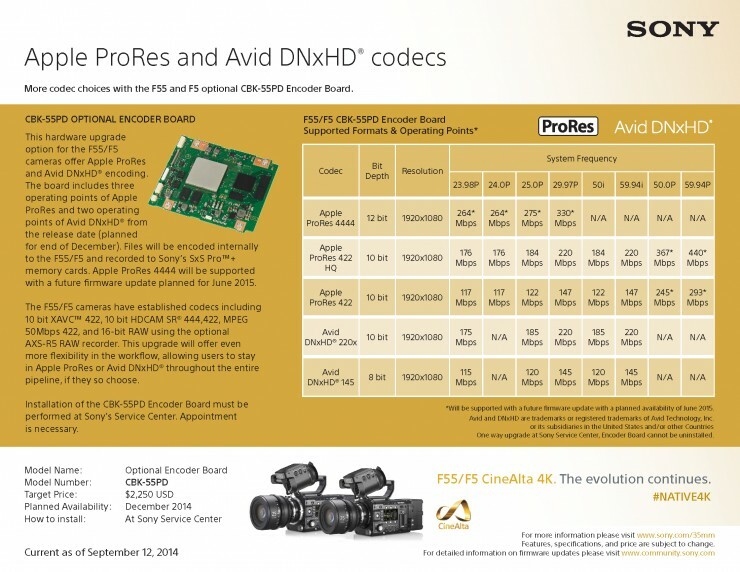 Going beyond upcoming support for a wide range of formats, including RAW, MPEG4 SStP (HDCAM SR), XAVC, MPEG2, AVCHD, Apple® ProRes, and Avid® DNxHD®,Catalyst Browse will work with Sony CineAlta and XDCAM camera lineups, among others. The new Catalyst Prepare software package enables secure and efficient management of recorded assets, enabling smooth workflows from shooting through editing. This package includes Catalyst Browse capabilities, and adds verifiable copying, file conversion, storyboarding, and EDL output support, among other powerful features. For more on these updates, check out the Sony forum.